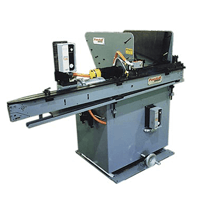 Model 1700 Magazine Style Automatic Bar Feeders can handle part diameters from 1/4”–2”Ø x 4”–28” long. Our heavy duty magazines can handle up to 4”Ø and 12’ long bars. Feedall’s magazine feeders can be used in a wide variety of applications from feeding centerless grinders to a robot loaded cell above! Shaft feeder. Bar/shaft diameter range 1/4 to 1 1/4″ and lengths from 3 1/2 to 28″. Model 1650 with 1″ wide silent chain, 72″ lg. Feedall Model 1650 1 72 exit conveyor with shaft kick off block and part tray. Feeds shafts from a manually loaded, floor mounted magazine. Shafts are fed in a continuous stream and escaped one at a time onto a front mounted cross-feed conveyor. The conveyor translates parts in a continuous stream to the workrest of a Cincinnati centerless grinder. Feed Piston Rods from a manually loaded, floor mounted magazine. The rods will be fed in a continuous stream and escaped one at a time rolling onto a front mounted, cross-feed conveyor. The conveyor will translate parts in a continuous stream to a Model 350-20 AE centerless grinder.